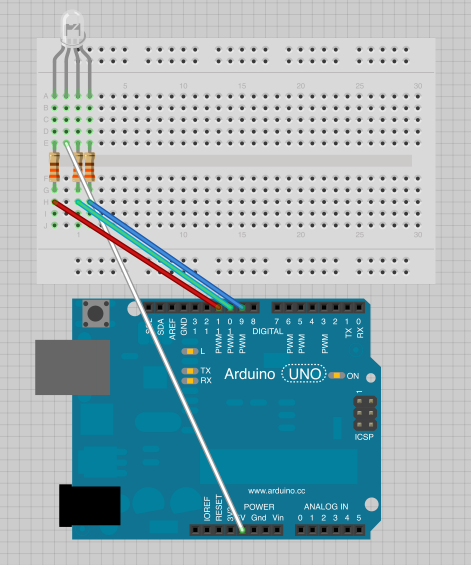 I currently have an anode RGB connected to the 11, 10, & 9 PWM pins on my arduino. However I would like to add 3 more LED's to my project, but I don't want to necessarily take up every single PWM pin (I still want to attach a shield). Is there a way for me to hook up all 4 LED's & still be able to only use a minimum number of pins? Keep in mind that I do want to use all 12 resistors for the 4 LEDS. Oh and all the LEDs will do the exact same thing (They all will be red, and all turn blue, etc) if that helps. I have three NTE123AP transistors I can use for this project. Fairly simple. Just using npn transistors. Duplicate per color channel. Your transistor can sink up to 600mA continuously. At 20mA per led, 4 per channel, that's only 80mA. That's more than enough. But make sure your power supply can support that. 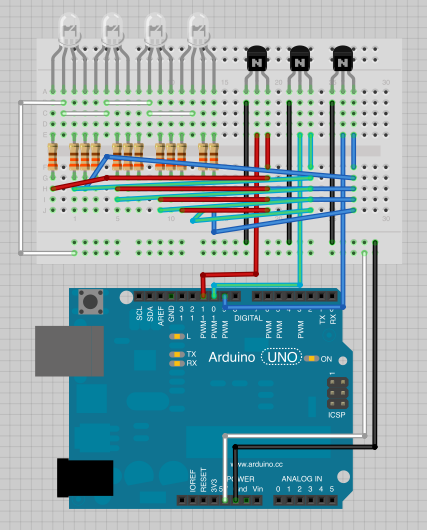 80 * 3, that's 240mA on the leds alone, not including the rest of the arduino, the transistor base, anything else you are using. @Passerby: Where did you get that schematic image in your post? Not the answer you're looking for? 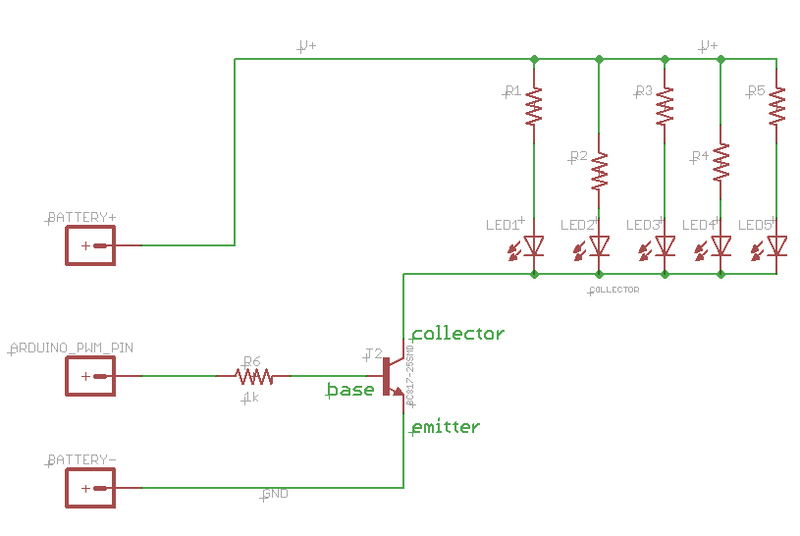 Browse other questions tagged arduino led transistors breadboard rgb or ask your own question. 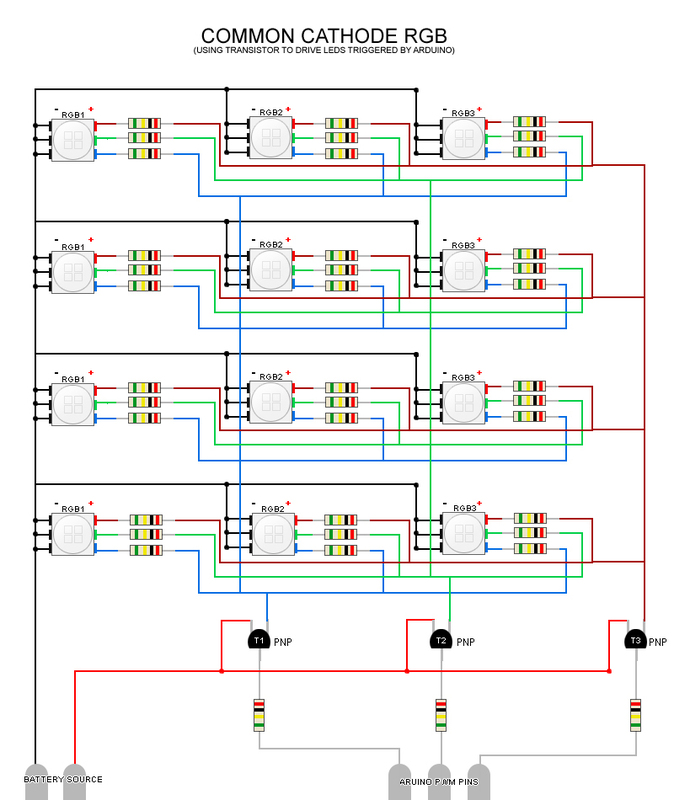 Powering RGB LED's and using a PWM chip; series or parallel?